Do you work for TSheets? Learning about TSheets? We can help. "Great Service intuitive soft ware"
Though we've only been using it about a week, I like the versatility it seems to bring. Adding to the schedule is pretty easy, you are able to view individual or company calendars on your mobile devices, notifications are functional. "Guru" staff seem to be very knowledgeable of their product and can walk you through most everything in a timely manner. I haven't found too much that I dislike; again, we haven't been using it very long, yet. Take the time to fully integrate all aspects of your business; I've been using it for a short time now and already see how this can be a game changer; especially for those of us that are analytically minded. Managing a mobile workforce presents it's own communication challenges; different employees have different day/night shifts so texting/calling can become annoying. Being able to add crew projects and more visibility to job costing analysis are probably my 2 main problems to solve. As we grow, duplicity and modularization of processes are keys to success for us. "User Friendly and Great support team"
I used this mostly with my previous employer so that I could keep up with how many hours I was working since I was managing 4 locations. It was easy to use and it really helped in a final decision that I was in fact working too much. We tend to forget that even though we may be home we may still be working into the wee hours trying to play catch up. I wanted to get this set up with my current employer, however, they already have a system in place. 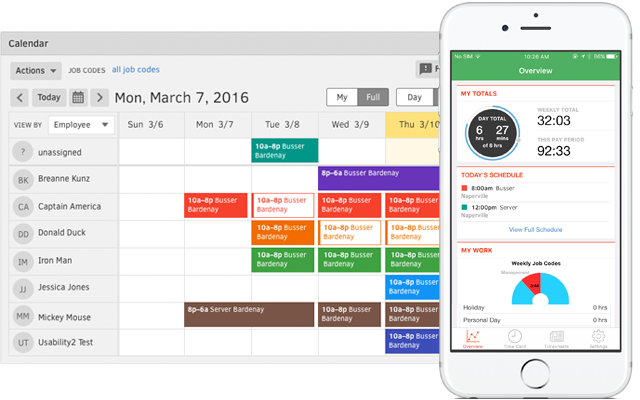 The best part is you can track to see who is working, paid time off, and access to your time clock if you are an employee. Really- there is not much to say in this category. The program is user friendly! To be honest I would love to ditch our current payroll program and utilize this program. Its easy for the employees to learn and there is an app you can download to your phone so they can utilize it to log in. Improving home life by tracking my time. When you are in management you don't realize how much you work until you put it in front of you. 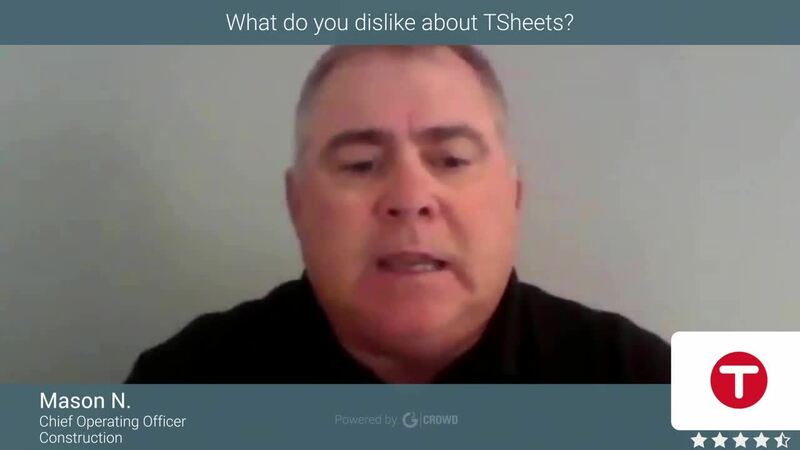 "Tsheets is the best for time tracking"
I like Tsheets because it's easy to access on the computer and the phone app. A Lot of times phone apps will crash or have issues syncing with desktop apps, but this one has no issues at all. I like how it tracks your location. You can also customize it per project so you can see how many hours you put into it. I don't always do it, but I like to export my timesheets just for information sake. I can't find much I don't like about tsheets, except if you have it running on your computer it automatically opens the app on your phone, and if you clock out on your computer, you have to wait until it logs you out or else the app on your phone will keep running. If anybody is wondering if to go with tsheets, I say try it and you will like it! You won't be disappointed! I think it makes everyone more aware of their time and how its used. Definitely for me, I find it a very useful tool. And again, the app is wonderful because the previous system we had was clunky and sometimes when I was "Mobile" it was hard to log in to track my time. This one takes about 15 seconds to clock in. I like that you can clock in using TSheets with just the click of a button. I also like that if I forget to clock in and need to go back to do it, I can do it pretty quickly and just adjust the time to reflect the correct amount of hours worked. I dislike the clocking out for lunch feature. I am very bad about remembering to clock out for lunch and very often I will clock out late and then have to go back in to adjust it. Although it is possible to adjust, I then need to adjust the number of hours worked and then go in and adjust my lunch. If I just try to change the lunch, it won't let me because the hours end up overlapping. I wish that there was a way that instead of having the hours overlap, it would just replace the time and have it count as lunch break INSTEAD of hours worked if that is what I was trying to override. If you are looking for an easy way for your company to keep track of your employees time sheets and what they are doing throughout the day then I definitely think that this would help you! It is easy to use and convenient because it is right on their phone. TSheets solves the business problem of having a physical place where we have to clock in. It is convenient because nearly everyone already has a phone and therefore can easily download the app and have it on them. A place that I worked previously had a physical wall mounted area where you had to type in an employee number to "punch in" and then keep track of what you did throughout the day on a sheet of notes. It was very inconvenient and this works much better. "Best company support and customer service for ANY company I deal with"
Their agents are SMART, well spoken, and super friendly. They not only know how to solve your problem but they are easily understood, friendly, and quick! Integrates wonderfully with Quick books - I used RIght Network hosting and TSheets has made themselves knowledgeable about the interface between their app and Right Networks so that they can intelligently assess the issues. Absolutley nothing! And if there was something I disliked and I told them, I am sure that within a short period of time, they would fix it. We were having an issue with path blocks when using RIght Networks and I had to call and spend time on the phone. A couple of months later Tsheets had modified their program with a "clear the path" button I could click on my own to solve the problem immediately. Time imports into quickbooks make payroll take 5 minutes instead of 2-3 hours. Accuracy of billing time has improved due to not having operator keying errors when entering time manually - employees can use Tsheets to request PTO which helps with communication and accuracy. The simplicity of this app and the intuitiveness of the design are the best part of Tsheets. The customer service with Lisa Patel has also been excellent. Anytime I've had a question, she's been prompt and helpful. When I was with Paychex, the customer service always felt like I was a chore and they did not know how to help. The upload process can be difficult to get set up in the beginning, but it just needs to be fixed by someone at Tsheets. Now I can use the time tracking in Tsheets, export the data, and upload it directly into Paychex. Tsheets is an excellent product to use for time tracking and can be easily integrated with existing payroll processors. We have solved the constant login problem for time tracking that our organization had with past apps. Tsheets has also been key in our reporting on grants for various grantors. Being able to track by program has made a huge difference in the robustness of our data. 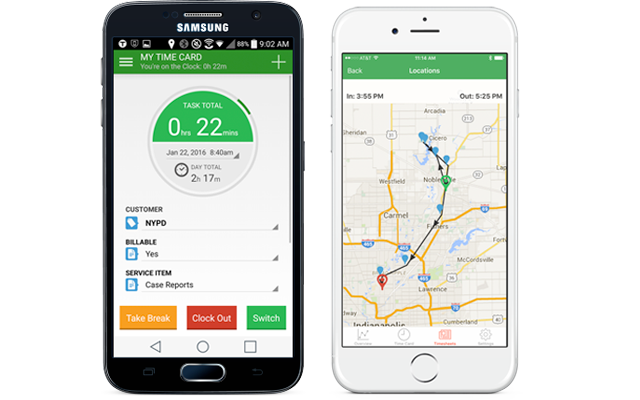 "Great for GPS tracking and employee responsibility time tracking"
TSheets is great for allowing your employees to be responsible for clocking in and out of work and switching their role on a job as they change from one activity to another. It makes it easier to keep track of more specifically what an employee is doing and the GPS tracking allows for accountability of employees clocking in and out when they don't always have a supervisor around. Editing timesheets is more difficult once an employee has submitted their time. Their needs to be more capability to bulk edit when the employee makes the same mistake all week on their time card. If you have employees that travel or work outside the office and are performing multiple tasks in a day that you want to keep track of. The ability to switch tasks with a few clicks of a button and have the accountability with GPS tracking makes this a great product. The multi-level manager approval makes this a great product as well. Clock in/Clock out from remote sites. Job Costing and Cost Coding to be specific about tasks performed throughout the day. "Easy to navigate user interface"
The user interface compared to the other time tracking software i have tested is by far the easiest, even for the technology illiterate, to navigate. The hardest part about implementing any new software is getting the buy in from the entire group. Having a the ability to instantly navigate where everything is made the implementation process very smooth. I would like there to be more customization in the features. For instance there is no separation on the definition of creating/assigning jobs. We would want to have anyone the ability to assign a job to themselves but only allow a "gatekeeper" to create jobs. Being able to define the features more would take out some headaches out of the initial set up. Take advantage of the test trail and allow everyone to "play" in the system to allow mistakes and create opportunities for group collaboration to learn and grow from the experience. We are considerably more accurate about tracking our hours on a job and billing appropriately. So. Many. Features. Tsheets is ahead of the game! They have, in my opinion created the most comprehensive Time tracking solution around! I love the Chat feature! JenD. recently helped us resolve an issue promptly, and with vast knowledge of the product. She was so pleasant! We love the fact that it provides our employees their schedule with details like who's also scheduled at the same project, as well a user-friendly way to record their hours independently; but with user settings to protect against time-theft. For employees phone numbers to be visible to all team members. Also that the system could send alerts to the employee when admin revise their time sheets. Another helpful feature would be the option for Administrators to send messages either scheduled, or immediate, to the employees, within the app. You won't look back! you'll wish you had found/tried this solution sooner!! We are saving $$$! so often people used to turn in inaccurate time-sheets. Administrators have the ability to compare, confirm, track, revise any time sheet entered incorrectly, or falsely submitted. This is a huge money-saver! It has also helped streamline and improve our in-house project reporting and Cost Code tracking, which is so useful for Profit Loss reports, and ensuring we are keeping track of labor hours and timelines! "A great time tracking app with mobile capabilities and lots of control"
I love the ability to control project assignments and product assignment to my employees. This means Employees are only able to track the type of work they are actually doing. I love the persistent notification on my Android phone which reminds me I'm still clocked in, and allows me to quickly clock out. I wish that the mobile app had the ability to keep track of duration - some of my employees switch between customers throughout the day, and while the mobile app does allow switching between customers, it ends up creating many many time entries - I'd like to just be able to keep a running timer for each customer. This should be possible because time booking can be done by specific start/end times, or by duration... so it's likely only a mobile-app function. A great application that ticks almost every checkbox in the quest for the perfect time-tracking app. Keeping track of time - both billable and non-billable, and easily transferring it to Quickbooks Online for billing. I was looking for a simpler solution to time tracking for our remote office environment. So far, this seems like the perfect solution to collect and report time and feed it to our Quickbooks application for payroll. Our past process was using up too many hours for employees and management. 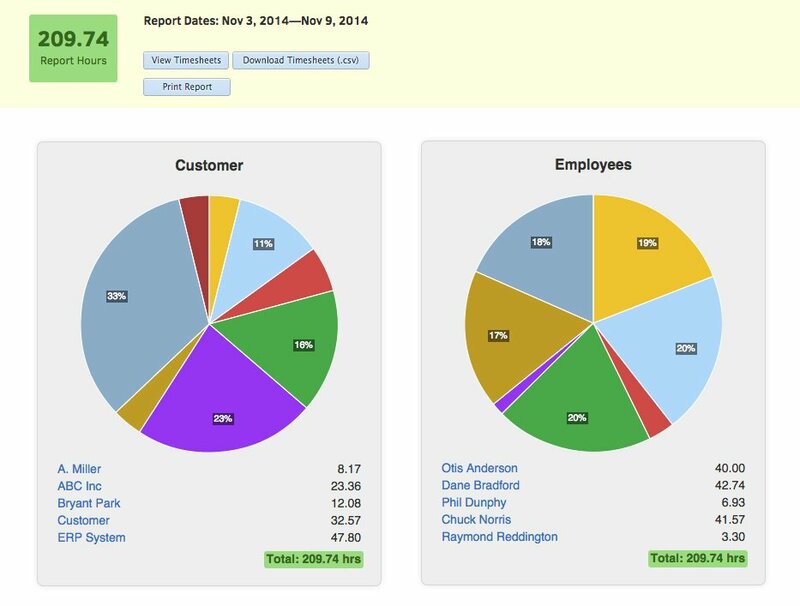 This looks like it will greatly simplify all of the time reporting and payroll processes. I am really excited to share this with our team and get it fully operational. Emily helped me set up the QB connector and get through the setup in TSheets. It was simple to do and she was great. The user interface is easy to understand. So far, absolutely nothing. It all looks good. But the list of industries available on this web site does not give an entry that matches our company. I chose software but we are a systems integrator. I needed to simplify time tracking in our remote-office environment. Past methods involved a lot of time updating job numbers, collecting time sheets and manually entering time into QB. This looks like it will greatly simplify reporting, improve tracking and reduce time and expense associated with payroll. Everytime I contact TSHEETs customer service I get a representative immediately. There entire team is AMAZING and always provide necessary support. This time I got the chance to work with Brooke T who not only joined me for my morning coffee sips but helped me figure out some settings. You ROCK Brooke! The only thing that I think could help my company out is with the Approvals. Our employees work different brands (jobs) which pay on different pay cycles so it would be better to filter time cards by brand within approval report so we can lock time cards that have already been paid and not have to run delayed approvals by month like we currently do. THIS HAS NOTHING TO DO WITH CUSTOMER SERVICE AS THIS TEAM IS OUTSTANDING! I received an email advising that an employee adjusted a clock out punch and I was unaware of this option, Brooke showed me how to find this setting and explained its benefits. "Exceptional service, both from a customer service stand point and how user friendly the program is." The simplicity of the application for tablets. My drivers were concerned about adding another step to their daily jobs. However, they like how convenient and user friendly the app is. I love how easy it is to manage and export their time. I also love the GPS component. If a customer calls and needs a delivery in a certain region I can check my drivers location instead of calling them. LOVE this program, I would highly recommend this service to other companies. It was slightly annoying that I couldn't just set up custom pay periods. We get paid twice a month but not always the same start and end pay periods. But, with a quick email I was able to get the dates I needed. If you are on the fence please take the time to do the trial. Once we did the trial we were sold. Great product. Time management. Not just for managing the drivers hours but also the time it used to take to verify time for them. We now get to spend less time working on fixing paper time sheets and get to spend more time on other important items. We now can export at the end of the pay period and send it straight to payroll. Another great thing about TSheets is that we can see where our driver is at or where they have been. I can located them quicker now. Also, I love that we can set up jobs and track what has been completed. At the end of the day we chose TSheets for its simplicity and its accuracy. "TSheets was a great method of logging in my hours at work." Overall, TSheets was very simple to use. As an engineer, I am working on multiple projects throughout the day. TSheets allowed me to log in the amount of time I was dedicating to each project everyday. In the end, I was able to see a chart of how many hours I've dedicated to a project in a certain time period. There was pretty much nothing that I disliked about this product. It was very simple to use and communicate with. While using Sheets it is important to note that you can make adjustments to times. I was able to log in my own hours and see how much time I was spending on specific things. This allowed me to properly distribute my time for following work days. The obvious is how simple it is to track employee times, and the ease of use when running payroll. I personally like the amount of visibility it provides me as a manager, not only on the clock in/out times but the ability to track locations at these times. They also provide excellent customer service. I recently used the live chat option, Kelsey T was very quick to respond to my questions, as well as maintaining an upbeat and friendly demeanor throughout our conversation. The way that our company utilizes T-Sheets, there is honestly nothing I would say I dislike. One of the challenges we had previously, which is not a challenge any longer due to T-Sheets, was being able to track the amount of time spent on the number of different jobs we are asked to perform in any given day. Being able to use a cell phone to switch between jobs has almost eliminated this challenge. "Excellent Product - Even better Customer Service - Truly Tremendous time Savings"
TSheets Customer Service is out of this world. I have had such great support from Luci and Elaina M.. Of course, I love the classic original team members like Dan B & Danny S.. But it doesn't matter who you get because they all support the core values.. The number one care in their eyes is you the customer. The App integrates smoothly with my QBO accounting software. Saving me hours of time tracking downtime. I am able to run multiple reports and gather any information that I need. The best time saver in my office. Start using internally and then build up the features. I am solving for collecting time from employees across the country. Benefits are that I can see who is working and where via location tracking. I also love the feature that allows you to block user access from certain computers. I know can check what jobs each employee is on and what time they started. I also love that I no longer have to ask for time cards! I've been using for 3 weeks. So I am not sure what dislike's will present after I've used it for a while. I was struggling with having my crew record time daily. Deciphering what they'd written down. Having to pull payroll report together in time to submit. All I have to do now is make sure a worker clocks in:) At the end of the work week, I run the payroll report and print. This has been great for Time & Material jobs due to the ease of running a report on a particular job! amazing! Other than the sense of humor from Emma R, who had helped me? I had all of my long winded questions answered, my requests for the time Sheet in particular made my day. I was provided suggestions to help, Emma even showed me alternatives T-sheets offered to help with my time recording needs. The ONLY thing I didn't like was the payroll item transfer function, it's only available for the online version of quickbooks, not desktop. It's not going to stop me from using the this amazing product though, however we do have quite a bit of employees, so it would make the process easier if the sync function for P/R items in QB to be transferred over and applied on employees in the future. If you have a question at all, call their toll free number, or get a hold of someone online through their chat system. These people really do love their customers and they will answer any question no matter how silly! The time it takes to have payroll completed, and tracking our lower tier tradesmen time more efficiently. I chatted with two different reps today, and spoke to another on the phone. Names...names...names...I'm terrible with names. My most recent chat was with Elaina M., and she lived up to, and exceeded my expectations for the "The Best Customer Service Ever", that I have come to expect, and brag about to all of my clients, from T-Sheets. I love your attitude and your patience. You guys always feel so genuine and Elaina was exactly that. Thanks! Can't think of anything........waited on hold just a little longer than I would have liked, but honestly, it was still quicker than any other vendor I deal with, so really not a complaint. Take full advantage of the support offered by T-Sheets, especially for the start-up and configuration. T-Sheets can do so much, and once the settings are where you need them, you are good to go. Take full advantage of the power by using the support that's offered at that level. You won't go wrong. today's customer and problem: Accessing T-Sheets on a Hosted Server, and moving T-Sheets from one company to another, and then, yet another. Managing the items lists, and customizing for the users as much as possible. "Awesome Customer Service From Jen!" She answered my questions quickly and professionally. Jen really makes you feel like she cares and is willing to help you out. This is my 3rd time needing help from TSheets support and each time I use the chat venue because they are always so knowledgeable and it is so convenient! They are an awesome company! Really helpful, the product is awesome and it is supported by the most awesome group of people! We are happy we made the choice to go with TSheets, hopefully you will make the change for success as well! Hopefully if you ever need help and use the chat feature you will get Jen! "Amazing customer service as always!" I love the live chat feature. I'm new to my account so I will have little questions throughout the day that I can have answered immediately. Elaina M is always so helpful! Even though I talk to a a couple different people each time I do the live chat, they always remember who I am and are quick to help and solve my issue. I wish it was easier to add a switch or an in/out punch without messing up another entry. Could be stream lined a bit. Tracking employees at over 20 different locations throughout the city. The benefits are the employees feel more empowered to keep track of their time correctly since their location is turned on, and I think in the long run this will greatly decrease our payroll cost due to employees previously messing up paper time sheets. "Can't praise TSheets Support enough - Cheers to Elaina M."
The Support Team at TSheets never ceases to impress me with their great service. Some companies' support teams are only concerned about solving your problem in as little time as possible, and they miss out on being friendly. Not so with TSheets! Every one I've chatted with there is so knowledgeable about their product and also super chatty, and will even chat about things unrelated to TSheets. Elaina M., it was a great pleasure to chat with you. Thanks for brightening my day by adding your own personal touch to my experience! IMO, there's nothing to dislike about TSheets. Don't spend frustrated moments trying to figure out how to make TSheets work for your specific situation. Get online with TSheets Live Chat, and they will be more than glad to discuss any problems you're having and answer your questions. TSheets provides a simple, detailed time tracking solution for us as a residential construction company. Having TSheets integrated with QuickBooks Desktop makes doing payroll a breeze. No more manual payroll entries from paper time sheets! "USER FRIENDLY - Easy to track Billable Items"
TSheets is very user friendly and easy to implement. We currently use it for both a maintenance company and a property management company. We have several properties and multiple owners and we can break down hours to see where we're spending the most time. It's great to know how long we're spending at properties for both maintenance and showings so we can make sure we're charging owners properly. It's also easy to keep track of billable items as we can select "billable" if needed and the default is "non-billable." It's also easy to modify hours if needed and our Accountant can easily manage everyone's time sheets if someone is out or forgets to enter holidays or vacation hours. 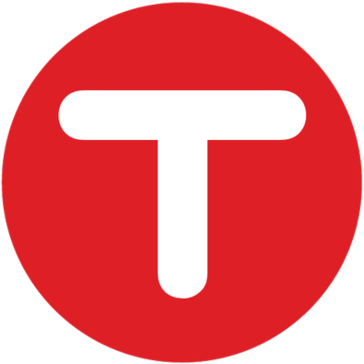 I also love that TSheets has an app for phones which is the KEY to making it so versatile and easy to use in transit. Without the phone app our property managers and maintenance team members would not be as efficient. I wish I could just change a single PUNCH instead of messing up the entire day. If I forget to punch out (or punch in) I only know to put in "total hours" for the day and it deletes all punch history for that day. I've never figured out if it's possible to just change the one mistake punch. That would be ideal. It would also be ideal to know how many PTO hours I have (that could be an admin user portion on our end). It would also be ideal if it was possible to record "start mileage" and "end mileage" so we could track the total mileage for the week for both property managers and maintenance. Make sure you have all employees tracking every single day and not going back weekly to "edit" or "add" things so it's the most accurate. Try to train them as SOON as you implement the product to achieve the best results - that way all employees get familiar with using the software. We're solving issues with challenging properties that are sucking up a lot of our time but before TSheets it was hard to keep track of exact hours. However, now we can show exactly how many times we've showed it or had maintenance issues at the property. That way we have proof of exactly how often we're at that location in comparison to the other properties we manage. Then we can bill the owner for additional time and attention to that property. "The perfect solution for time tracking and integration with QuickBooks." First, the integration with QuickBooks makes my life easy because I don't have to keep track of my contractors and clients twice. Next, I love being able to see a report of all the time mid-month to ensure we're on track for budgets. The support staff at TSheets is super-awesome as well. And, while I think the software is great, some of my contractors who are less than accepting to "new ways" of doing things, immediately embraced TSheets and starting using it via the mobile app right away. I wish the interface was a bit cleaner, but, the mobile app is awesome for just the time-tracking part. Another item I wish existed was a Mac desktop app so I don't have to go to the website and have another tab open. But, I'm able to use the mobile app instead which works just as well. TSheets as a stand alone product is quite valuable. The real value happens when you integrate it with Quickbooks, in my opinion. I needed to have all of my financial information in one place. By using TSheets, I'm able to use QuickBooks to keep track of all the people... and TSheets to keep track of the time. My contractors didn't want to use the old time tracker... so they didn't... but this time tracker is so easy to use they all are happily using it now. "Integrates easily with our payroll"
This plugs right into our payroll system, and it makes it super easy for our hourly staff to keep track of their time. The interface is easy to use, and it is easy to keep track of exactly how long hourly employees are working so that we can accurately pay them. The integration with Gusto, our payroll software, was super simple as well, which was great for setting up as we made the transition from all salaried employees to having several hourly employees. It would be nice if there was a more robust scheduling feature, as not all of our employees have set schedules and it would be nice to have more flexibility in setting work hours. There was a bit of a learning curve in setting up multiple employees and the supervisory chains, but that gets easier one the initial set up is done. It would be great if there were more built in tutorial options for this as you're going through the set up process. If you use a payroll software like Gusto, TSheets integrates into it super easily and seamlessly, and it makes the transition to having hourly employees come on board go much more smoothly. We previously only had salary employees, and implementing TSheets allowed us to track our few hour employees really easily without having to change our payroll cycle and without having an effect on the existing salaried employees. We only have a few employees that are hourly, so this allows us to keep track of their hours easily without having to overhaul their payroll. It's also easy to go back and correct hours and time if an employee does not log in correctly or if they forget to log in in the first place for their shift. Being able to easily edit the time sheets is great and makes the hours much more accurate. Ease of use for both employee and employer. I also like the live chat option in the event I need to ask a question and get an answer right away. The people I have talked with on the live chat have all been very friendly and helpful. 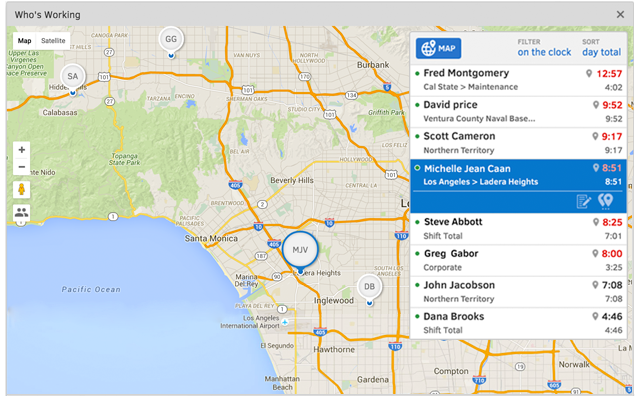 I like the employee tracking so we can make sure that our employees are where they need to be. It seems as if the app has to be updated often otherwise there are glitches that our employees experience. Some of our employees have to delete the app and redownload every now and then. They sometimes get clocked out when they are technically still on the clock. Employee tracking and hours. Being able to track our employees while they are on the clock to insure that they are doing what they need to be doing. 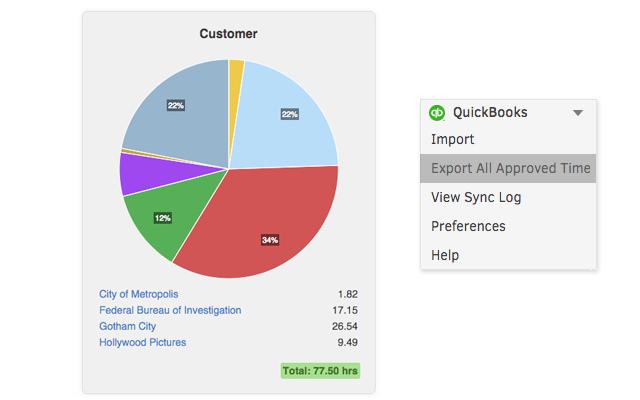 Our employee's hours are easy to import into Quickbooks where we can then run payroll each week. Tsheets makes it easy to keep our employee information in one place and keep track of hours worked. My employees are all remote and several travel often and they have all given positive feedback on using TSheets. They like that they can access it anywhere and it is very straightforward. Also, our Accounting team really appreciates how it smoothly syncs with QuickBooks and that we can do job costing. Most of all, when I had a question, I appreciated the fantastic support I received from #JenD. She was awesome and so friendly! When it is time for me to enter payroll, I just run an Approvals report and my employees hours are color-coded and clearly laid out. Nothing so far that I dislike. It has been easy to use and my employees are happy. "Automating the clock in, clock out, payroll, scheduling using a software"
The process of registering for the Tsheets is quite simple and the option of setting up a Google authentication for sign-in gives the extra layer of security which I feel is the highlight of this product. The product is beneficial for early stage start-ups where the entire process of payroll and scheduling is automated and it is perfect for companies who have remote working employees on board who can clock in using a simple software. By using TSheets my company was able to streamline their workforces check in and clock out times. It gave flexibility in scheduling especially for the employees working in teams. Automating the payroll report and the option where employees could generate their hours'worked and their schedules are some of the benefits that I personally had realised. Tsheets has great customer service. Quick response time, but more importantly they offer to go the extra mile. When I've needed assistance I always chat instead of calling. Whenever my issue is complicated, even if resolved over chat, they ask me if I'd like to have somebody give me a call to run over the steps I should be taking live as I do it. The latest concerns were addressed by Dawn S, who was actually fun to talk to while helping me work out some confusion I had. Admin experience is a bit clunky. It imitates a desktop experience in a web app, opening and closing many different windows. I only use one window at a time so it is an unnecessary feature for me. Good choice. Has a lot of bells and whistles I don't need, but I just ignore those options. My employees have a simpler view than I do so it doesn't over-complicate their experience. Timesheet tracking and exporting to my payroll software. All of my employees are remote and process timesheets via a cellphone app. The phone app is a very clean interface. It was literally 1 day of implementing my contractors to use it. The setup took me some time but it is saving me hours in invoicing and contractor pay. When I run into an issue, I start chat and I am guided to solving my own problem by awesome support people like Elaina M. She had me off and running in 5 minutes. Thanks! Really my only dislike and it is so easy to work-around is it is very geared to employees and I have contract labor. Try this for your small business. Approval of contractor time. Before it was a rush to review their submitted time and invoices and now I do it weekly so i don't hate the 1st and 16th of the month anymore. I am also using it to inform my business goals. I had to go to customer service for the first time over a simple fix. I used the chat feature and got the issue resolved right away! Thank you, Elaina M., for your help! Due to being a general construction company, we have found that the most useful feature on TSheets is the job costing feature, and mobile features, making it easy for our employees to clock in directly from the job sites. Employees often express frustrations when working with the TSheets app and have had to delete and redownload the app. It also somehow clocks them back in after they have clocked out for the day or they have been clocked out while they are still on the clock. Being able to job cost per customer, per project. Also, being able to keep track of time and employees. Elaina M was fantastic at helping me with an issue I had over the weekend. She was so quick to respond and made the process very easy, OVER MEMORIAL DAY WEEKEND. She was polite and down to earth. From 1-10, she’s an 11. Only dislikes, I keep getting locked out. Which is probably just my fault and forgetting which variation of password I used the day I made my account.... Also, the last application me and my company used allowed some of us to get paid a day early due to the credit union in which we were associated. I do love T-Sheets desktop site though! "Great for Depth not super intuitive"
I like that there seems a lot of features available if I needed them but I personally didn't take advantage of most of these. It is also free for use on only one person yet doesn't seem quite designed for just one person to use. That it wasn't all that straight forward it seemed somewhat difficult to use just to track time for me. I would say I recommend if you use this product that you use it for managing multiple employees instead of just one as I didn't find it highly useful for myself when implementing it for a single person. But it is a free solution and it integrates well with other programs which is a pretty big upside when compared to alternative options. But I would say my preference definitely was a simpler program when using it for just myself. I needed a solution to track time this was free for individuals so i took advantage of it but it was difficult to use for just one person with extra depth that i personally didn't need but is a nice feature for managing more people. TSheets Tech support by phone has been stellar. 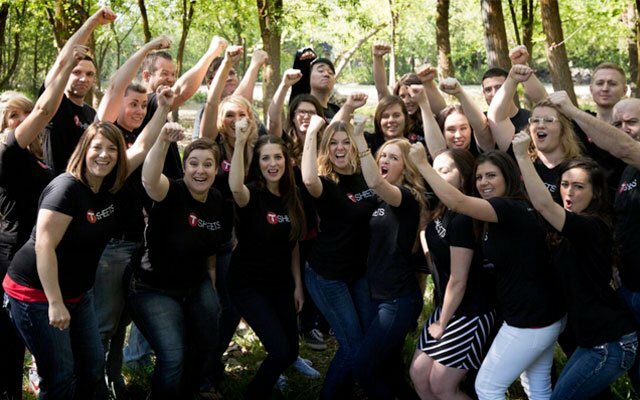 • Every single TSheets person who answers the phone is noticeably happy to be working for TSheets and is eager to solve your TSheets-related problems -- I'm not exaggerating. • Luci helped me today re-learn how to set up PTO accruals, documented my many issues and stayed with me on the phone until they were ALL resolved. • Shannon helped me roll over PTO from 2016 and set up a couple new PTO types. She listened well and made the process educational, clean and speedy. Fun, I dare say. Terrific use of the very slick Join.me screen sharing app. Live Chat support is also fun and easy. TSheets rep was unable to provide the specific features or settings I would lose if I disabled our DCAA Compliance Add-on. • It's a tall order for an online time tracker app to ensure compliance with esoteric and ever-changing federal guidelines, and an even taller order for a call center rep to have a handle on all the impacts. You will appreciate the downright enthusiastic tech support. • Jury is still out on the DCAA Compliance Add-on. I'm solving recruiting and retention problems. • Our employees are all software engineers. So, they "demand" intuitive interfaces, a modern mobile app, and responsive bug-fixing -- and they talk to each other and to potential hires. "Jake is the KING of T-sheets Help! Hail to King Jake"
The system is user friendly and makes payroll and job costing much quicker and much more accurate! I have been impressed with my interactions with Jake in your customer service department. He has been wonderful helping me get the most out of T-sheets and making use of all the options. Jake is patient and he listens when I am having an issue. I had a few issues getting the most out of your available options, but Jake has helped me more than once navigating t-sheets and teaching me all it's capabilities. This is a very user friendly time sheet program. I was able to quickly get everything up and running. It is easy to add employees and set app up on their phones. Our employees have more accountability. The online T-Sheets chat and customer service help is top notch! "Amazing! Best company EVER! "